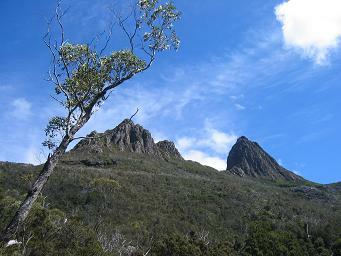 Cradle Mountain is the highest peak in the National Park which bears its name. Places like Cradle Mountain National Park were just made for perfect days like this, I thought to myself. But then again, such spectacular beauty would shine out no matter what the weather. How did I know this? Just the day before when it was raining heavily, I had come by for a quick visit and a few short walks. And how were the views then? Breath-taking! Well today the weather would allow us to spend more time in this beautiful place. Having arrived early in the morning, we went straight to the Visitor Information Centre. Parks and Wildlife staff were on hand to help with our questions. After some discussion with them, we decided that we would go to Marion's Lookout. Marion's Lookout was named by Gustav Weindorfer, after Marion Cowle, his sister-in-law. And who was Gustav Weindorfer? He was a wonderful Austrian man whom we can thank for playing a role in the preservation of this very special part of Tasmania. Apparently he and his wife Kate built a home here after falling in love with the area. We were soon to understand why. We made sure to stop at the walker registration booth to record our intentions in the log book. This should be done for any walks which would take more than 10 minutes. I made a mental note telling myself that we should also de-register on our return. At the beginning, the walking track was fairly flat and thus, an easy walk. 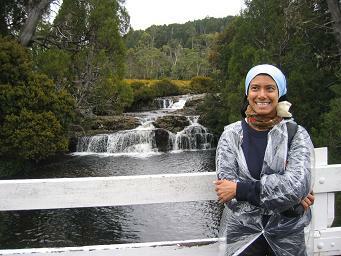 We passed pretty rainforest areas, cheerful streams and a gorgeous lake. 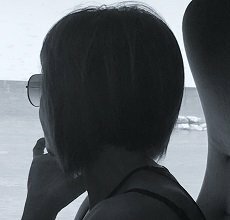 We had to remind ourselves to keep going as it was so easy to stop and lose track of time as we gawked open-mouthed at everything around us. Eventually the track started climbing upwards, and the path started to get rockier. Yes, we could now tell that our destination must be a lookout as we seemed to be heading for an elevated position. Would it be soon? Around the next bend maybe? And then - we were there! Oh, what incredible views! We could see shimmering lakes and rugged mountains. 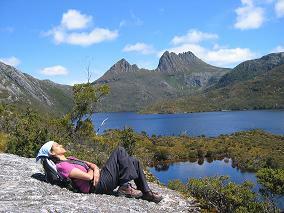 Including of course, the magnificent Cradle Mountain itself! Never had I found a more perfect spot for lunch. What a treat that we could now sit here and take a little time to admire some of the best scenery that Tasmania had to offer. Keen to do the Dove Lake Circuit walk before it got too late, we began our return. We had been advised that the most direct route to the Dove Lake Circuit walk was rough and steep and should be avoided. Instead it would be better to go all the way back to the Dove Lake carpark before commencing our walk around Dove Lake. When we arrived at the carpark, we started off around the eastern side of the lake, heading in a clockwise direction. I found the perfect rock for soaking up the sun. 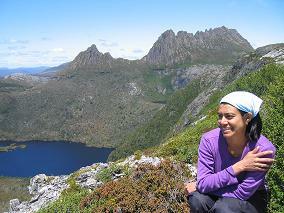 I was feeling pretty serene with Cradle Mountain watching over me, ever-present in the background. I left my beloved rock and continued along the boardwalk, past rocky beaches, through more pretty rainforest. As we neared the far end of the lake, we found ourselves in the shadow of the mountain. Could you call this the ant's eye view? Returning along the western side of the lake, we continued to be amazed at the views of the lake and mountain. The delightfully named Ballroom Forest got me wondering how it got its name. I couldn't help but wonder if it was because the surroundings were so uplifting that you felt like dancing! As we headed for our car, it was just getting dark. We were filled with satisfaction that we had made the most of the daylight. And yes, we did remember to de-register at the walkers booth! I am still haunted by the wild beauty of this ancient landscape. 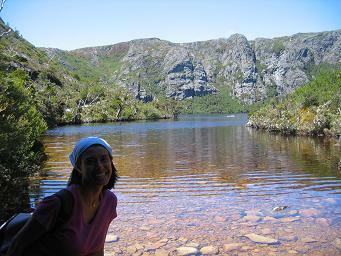 I look forward to returning to doing more walks, maybe the one to the summit of Cradle Mountain itself.